A Government of National Union will be formed. Pending Cambodia's return to a normal situation, a Consultative Assembly will be established. Its members will be qualified representatives of the Buddhist clergy, the army, the police, the provincial guards, youth, intellectuals, peasants, workers and others who live by their labor, industrialists, business people, civil servants, women, etc. belonging to all patriotic, progressive and anti-imperialist tendencies. A National Liberation Army will be created to free the country from the dictatorship and oppression of the clique of traitorous and pro-imperialist reactionaries headed by Lon Nol, Sirik Matak and Cheng Heng and for the struggle against the US imperialists - their masters. The Government of National Union, the Consultative Assembly and the National Liberation Army will unite with the rest of the people to form a united front to be known as the National United Front of Cambodia which will have the double task of liberating the country and reconstructing it after victory. I knew from the experience of our Vietnamese friends that the road to victory would be long and hard, but shorter for us because of the experiences and successes of the Vietnamese. the country to go underground and await arms an training, and asked those abroad to try and make their way to Peking. There were erociously repressed uprisings and seizures of power all over the country in the days that followed; the Western press unfortunately reported only those in the eastern provinces close to the capital, where journalists had easy access. In vast areas, Lon Nol's administration simply evaporated before he could get it organized, and it has not been reconstituted since. He tried to pass off the uprisings as the work of the Vietcong, but Western journalists said otherwise. The Financial Times accurately described them as 'an almost spontaneous outburst of rural dismay at the departure of a ruler who made every effort to win the sympathy of the countryside'. Between 26 and 30 March, hundreds of my compatriots unarmed - were shot down in cold blood for demonstrating in my favour. At least thirty were killed on 27 March at the Neak Luong ferry, some forty miles from Phnom Penh on Highway 1, leading from Saigon. Another fifty were killed in the town of Kompong Chain on the same day when Lon Nol's troops fired into a crowd point-blank with anti-aircraft, heavy machine-guns. About fifty more were shot down at Suong and Memot, both near the South Vietnamese border. Journalists reported counting about eighty corpses at Takeo and twenty to thirty each in the towns of Prey Veng and Angtassom. The dead were indisputably Cambodians. I have photos of long lines of our peasants, hands tied behind their backs, awaiting their turn for the firing squad; of students executed by being beaten to death in front of their fellow students. We were able to identify some of the executioners, at least, as the CIA-suborned 'deserters' from the Khmer Serei, whom Lon Nol had infiltrated into the Phnom Penh garrison and the military police. In a broadcast on 4 April, I reported that over three hundred patriots had been massacred, and again advised my supporters to go underground, 'to go into the jungle and join the resistance forces already there', and where by now arms were available. Lon Nol had secretly and systematically worked to separate me from the left. But the Khmer Rouges later told me 'We never suspected your patriotism and devotion to the people. We always distinguished between you and creatures like Lon Nol and Sirik Matak.' That there was no need for negotiations between us struck me very much. I had launched an appeal, and they had responded wholeheartedly. When, later, we formed the Government of National Union, Khieu Samphan was appointed Minister of Defence (later deputy Premier as well), Hou Youn became Minister of the Interior, Communal Reforms and Cooperatives; Hu Nim, Minister of Information and Propaganda. As the question of the previous hostile relations between the government and Khmers Rouges is intimately linked with the speedy takeoff of the resistance movement in March 1970, it is worthwhile looking into the origins of these bad feelings. Lon Nol became Prime Minister of the right-wing assembly that emerged from the 1966 elections. In early 1967, he deliberately provoked what became known as the 'Samlaut affair'. cultivating it since. His officers produced documents to show the land 'legally' belonged to this or that local official, and ordered the peasants to pack up and leave, for he wanted the land to settle the Khmer Serei, the so-called deserters, as a reserve force of shock troops for what he was planning. (Even as early as 1967, one of my ministers, Chau Seng, had warned me that Lon Nol was plotting my overthrow. It seemed so improbable that I disbelieved him. Chau Seng later went into voluntary exile in Paris, and, after the March coup, became one of the first to rally to the National United Front. He is now Minister of Special Missions. The Samlaut peasants acted as peasants have done throughout history. They resisted. And they were supported by the people. There were mass demonstrations in Battambang city in their favour. There are many Chinese and Vietnamese residents in Battambang, and they joined the protest. This gave Lon Nol the pretext he wanted in order to claim there was a Chinese-Vietminh plot to take over the country. The left-wing deputies were denounced as Maoists and had to flee Phnom Penh. Open warfare began between the peasants and the Lon Nol forces. I was out of the country at that time, but the reports sent me by Lon Nol genuinely sounded as though the whole thing were a revolt directed from Peking and Hanoi. had already instituted a witch-hunt against the left, and many young people had followed the example of the three deputies and fled Phnom Penh for the security of the jungle. The CIA was not slow to take advantage of the situation. They started a campaign of rumours and distributed false tracts in the name of the Khmers Rouges - tracts which I denounced at the time as lies. The armchair experts who accuse me of having turned to the right in 1967, should take into account the extremely tense and complex situation. For the first time, there seemed to be substantial evidence that our independence was being threatened from the left, a possibility I had always resisted admitting. As for the long arm of the CIA, there was a fascinating revelation by a CIA 'Green Beret', Captain John J. McCarthy, Jr, one of the accused in the case of the murder of Inchin Hai Lam, an alleged 'double agent' of Cambodian origin in the pay of the CIA. McCarthy resigned his commission in May 1971, disgusted at what he had had to do - not to mention the way in which he had been treated by the US army for having obeyed CIA orders. He revealed at the time that he had headed a CIA team in an 'Operation Cherry', which involved leading a Khmer Serei unit deep into Cambodia. This much was revealed in the Norfolk Virginia Pilot on 25 May 1971. John J. McCarthy, Jr, formerly a Captain with the US Army's Fifth Special Forces and commanding officer of a top-secret Cambodian operation known as 'Operation Cherry', says Son Ngoc Thanh was a key figure in his 1968 court-martial. McCarthy was accused of killing a Cambodian interpreter, who was also a member of the Khmer Serei, a secret, right-wing rebel sect, headed by Thanh and reportedly financed by the CIA. The ex-Special Forces Officer was convicted of murder and served two years of a 20-year sentence before his conviction was overturned on appeal in 1970.
at the two-day trial at Long Binh, South Vietnam, in January, 1968, but the Army said it could not compel foreign nationals to testify. At that time Thanh was living in Vietnam, where he was a powerful figure among the Cambodian minority of that country. Thanh did not testify, but the trial record reveals that US military officers met with members of the Khmer Serei - and possibly with Thanh himself - at a pagoda in Saigon shortly after the agent's death. At that meeting, the US paid an indemnity, reportedly 25,000 dollars, to the Khmer Serei for the death of their member. The transcript also indicates that Project Cherry was set up to conduct incursions into Cambodia from across the South Vietnam border. For this covert mission, the US hired Cambodian guides and interpreters, at least some of whom were members of the Khmer Serei. During the trial, McCarthy identified the Khmer Serei as an 'organization which in effect plans the political overthrow of the Cambodian government'. Although the heavily-censored unclassified version of the transcript makes no direct reference to Thanh, the record refers to a man named Tan Son Hai, who was identified by one member of the Cherry team as 'the leader or high priest of the Khmer Screi'. McCarthy told this reporter he believes that Thanh and Ton San Hai are 'one and the same person'. Prior to the trial, the Khmer Serei presented McCarthy with a gold medallion for his 'revolutionary act' on the assumption that he had killed the agent, whom the Khmer Serei believed to be a Communist-trained double agent. The citation accompanying the award was signed by (Son Ngoc) Thanh as 'leader of the Khmer Serei'. Hancock: Because Special Forces was involved in the ... (classified) he asked me if I would go to the pagoda to see if I could make an arrangement for him to meet with Tan Son Hai. Q: Who is Tan Son Hai? A: He is the leader of the ... (classified) in South Vietnam. Q: Did anything occur with reference to this proposed meeting? A: I made a meeting for 6.00 that evening. And Col. Grover, myself and Maj. Adams met with Tan Son Hai, and the interpreter. And Col. Grover told them exactly what happened; they thought he had been killed by an American captain. Q: What, if anything, was their reaction? A: Well, he didn't seem bitter or anything, so first he asked how much money the American government would pay for Inchin Hai Lam's death. So a price was agreed on; we made an arrangement, or he made an arrangment with me to deliver the body the following morning to the pagoda in Saigon. Although Project Cherry ended prior to McCarthy's trial, Green Berets continued to conduct covert intelligence operations in Cambodia for the CIA. The 1969 death of another suspected double -agent emploved on a secret Cambodian intelligence project caused a sensation in the press when the Army attempted to court-martial eight Green Berets, including Col. Robert Rheault, the commanding officer of the Fifth Special Forces in Vietnam. The Army dropped the charges when the CIA refused to testify. Captain Robert F. Marasco, one of the Green Berets involved in the latter case, ran two intelligence nets in Cambodia during 1968 and 1969. His mission, he told this reporter, ranged from 'pinpointing targets' and gathering information in Cambodia, to 'keeping tabs' on the whereabouts of Sihanouk when the Cambodian ruler visited the countryside. Marasco said he hired and trained Khmer Serei agents, as well as other Cambodians for his missions. mission was 'Blackbeard', that it was divided into two groups with a network of agents 'in all of the Parrot's Beak and sometimes as far as Phnom Penh'. Among the tasks of the twenty South Vietnamese and Cambodian agents employed by Marasco was that of keeping watch on Prince Norodom Sihanouk, which meant, among other things, deciding on propitious moments for assassination attempts. What 'Operation Cherry' and the 'B 57' groups were really up to may never be known. Journalists have informed me that it is unprecedented that the full transcripts of the McCarthy trial were put on the 'top secret' list. Not the least of CIA activities in 1967, at the time of the Samlaut affair, was the distribution of inflammatory leaflets in the name of the Khmers Rouges aimed at giving Lon Nol the pretext he needed to step up his persecution of the left and to drive a wedge between the Khmers Rouges and myself. .
Fortunately the jeep accident in which Lon Nol was injured removed him from the scene at a critical moment, and I was able to look into the Samlaut affair myself as soon as I returned. I found the peasants did indeed have justifiable grievances, and I immediately dismissed the governor of Battambang. I publicly announced the responsibility of the authorities in the unhappy affair, rebuilt villages that had been destroyed by Lon Nol's troops and settled the peasants back on their lands. Lon Nol's accident made it easy for me to reshuffle the cabinet to bring back Penn Nouth as Prime Minister. the rebellion was a strictly internal affair without any foreign support or encouragement, and the Royal Government will settle the problem by its own means and as it thinks best. The Fineberg account was published by Dispatch News Service International, Washington, 5 April 1972. Marasco's NBC interview was published in International Herald Tribune, Paris, 3 June 1970. I did not know anything about 'Operation Cherry' at that time, but I clearly recognized the long arm of the CIA in the forged leaflets and in the phrasing of certain slogans that were launched against me. However, Lon Nol's witch-hunt against leftist intellectuals, and the military campaign against the Battambang peasants, combined to drive both groups into an attitude of open, armed defiance which died down after I intervened in the Samlaut affair, then blossomed forth after the 18 March 1970 coup. In connection with the cloud which passed over my relations with Peking (but never with Chou En Lai, with whom I remained on the best of terms) there occurred a regrettable incident in August 1967. The Chinese-Cambodian Friendship Association in Peking had addressed a message to the Chinese-Cambodian Friendship in Phnom Penh, implicitly advocating my overthrow. From L'Année Politique et Economique, Paris, July 1970.
gained control of China's foreign policy, and were issuing all sorts of provocative instructions through their embassies abroad. Not only Cambodia suffered from this, but in our case it did, unfortunately, happen at a particularly crucial moment in our postwar history. Chou En Lai told me that the leaders of the association in Peking had been punished. In general, the 'ultras' who emerged at the height of the Cultural Revolution were later thoroughly discredited, but not before much harm had been done to China's relations abroad. To throw my own dissenters - rightists such as Lon Nol off the track, I occasionally made speeches attacking the Vietminh, Vietcong and Khmers Rouges. The first two realized that the main thing was my unswerving political, diplomatic and material support of their resistance struggle. But I did not know at the time that the Khmers Rouges had also understood this. The proof was their immediate acceptance of the alliance for resistance in 1970. What had depressed me in i967, when I saw so many hundreds of Cambodian young people deserting home, studies and professions to march off to jungle and mountain guerrilla bases, turned out to be a blessing when I sounded the call for armed defiance in March 1970. The bases were there; the arms came soon after. The NLF, which had been very reluctant to give arms to the Khmers Rouges in 1967, thus risking a Cambodian civil war which might bring about US intervention, had no such misgivings in March of 1970. Immediately after the coup they started distributing weapons stocked in the frontier regions. When the Americans attacked six weeks later they were dismayed to find the storage areas almost empty. A high proportion of these arms went directly into the hands of the first units of our Peoples Liberation Armed Forces. Mountains in the west. The Khmers Rouges were quickly joined by tens of thousands of what some journalists called 'Sihanoukists'. These were peasants and townspeople, soldiers, including entire army units which had remained loyal to me, and Vietnamese and Chinese residents who joined us for ideological reasons, or because they saw no alternative if they wanted to remain alive - and free. By mid April, most of Cambodia was liberated, and our forces were knocking at the gates of Phnom Penh, eager to join our supporters inside the city. This, despite the importation of the 'Mike Force' (KKK commandos) for the defence of the capital. The Lon Nol-Sirik Matak regime was sagging at the knees, knocked on to the ropes, and awaiting the final count, when the United States invaded Cambodia with its own and Saigon forces on 30 April 1970, in one of the most flagrant acts of unprovoked aggression in modern history. No word but '-aggression' can be applied to this act. Lon Nol, to cover up his own involvement, claimed that he had neither invited the Americans in, nor had received any warning of the invasion. It is hard to believe, but this is the official, on-the-record position of the Lon Nol-Sirik Matak government. On 2 May, in the first days of the invasion, Lon Nol was reported by Western journalists as 'pondering' whether or not to lodge an official 'protest'. In the end he decided to 'approve' the invasion! I address this appeal to my fellow countrymen who are Buddhist. It is believed that our religion will last 5,000 years. We at 2,500 years, right, in the middle, of the Buddhist era. It is also believed that the Buddhist religion will prosper during the next 500 years. According to an oracle, the current war in Cambodia is a religious war. Our religion is Buddhism. We have our bonzes, our prayers, our disciplines, and belief that good will be rewarded and evil will be punished. The communists do not believe in religion because they do not believe in the existence of Buddha. I wish to inform my fellow countrymen who are Buddhists that an oracle has predicted everybody will enjoy equal rights. Everybody will be happy and good when this religious war ends. But while the war is still going on, you must respect your religion and pray. Those who follow this advice will be spared all misfortune and will be rewarded with security and prosperity. The oracle who predicted a religious war in the middle of this era said that gold and silver palaces and will be erected in the middle of the four branches of the Mekong, and that there will be killing in the middle of the four branches of the Mekong. This means the enemy of Buddha will kill the religious people. Then the King will flee, and a comet will appear. When the Khmer people refused to abandon their Buddhist morality and to aid the Vietcong aggressors, the war broke out in accordance with plans mapped out by the Chinese and North Vietnamese communists. China does not love Sihanouk; it is using him as a tool to help the Vietcong wage war in our country with a view to transforming it into a communist base in South-East Asia. To make it easy to understand, according to the Buddhist religion, there must be war - a war against the Vietnamese communists who consider religion their enemy. In this religious war against the Vietnamese communists, who are the enemies of Buddha, there are many Buddhists who will come and help us. Our country will win final victory on the battlefield as predicted by the oracle. Therefore, we Buddhist believers must rise up together to struggle against the enemy who is committing the war of aggression in our country. Press, New York, February 1971. Hundreds of executed Vietnamese bodies floated down the Mekong River Wednesday morning, many of them with hands tied behind them. It appeared to be the greatest mass killing yet disclosed in Cambodia. The stench swept across the broad waters, and ferry passengers gagged as the ferry churned through bodies floating in the river. A religious killing! Many of the Vietnamese were also Buddhists. And those who were Catholics? Buddhism preaches religious tolerance. Who are 'the many Buddhists who will come and help us´? Since when have Americans been considered Buddhists? I would urge all members of the US Congress and the American public at large to read Lon Nol's speech and then to assess the sort of leaders to whom they have entrusted so many hundreds of millions of dollars, and the political and moral philosophy being endorsed with American treasure and military might - not to mention prestige. Foreign officials in Phnom Penh who brood over Cambodia's problem and vie for Lon Nol's car may be a bit disconcerted to learn that the premier gets some of his most intimate advice from a clique of Buddhist monks who often see him for hours at a stretch. High among these well-placed advisers is Mam Prom Moni, a crafty-looking 20-year-old bonze whose confident air and haughty demeanor befit his title: 'Grand Intellectual of Glorious Purity'. Perhaps rumours of CIA-manipulated soothsayers are not so far-fetched after all! One can readily understand why so many of my compatriots, faced with a choice of listening either to the obscurantist ravings of this turncoat or to logical, intelligent appeals to patriotism, national unity, and militant solidarity with comrades-in-arms across our borders in Vietnam and Laos, did not hesitate to choose the latter. With the invasion of 30 April, Nixon's military strategists hoped to crush our resistance forces before they could get organized, and to smash the NLF in a vice between Lon Nol's forces and their own. The western jaw of the vice did not close because Lon Nol's forces had no stomach for the fight. Our embryo resistance forces, on the other hand, gave a good account of themselves. The 'Vietcong Pentagon' proved non-existent; the overwhelming bulk of supplies in the frontier bases have been transported elsewhere - as the Americans were to find out in the spring of 1972 - or are in our hands; the 'sanctuaries' now spread westwards to include most of Cambodia. Nixon's Cambodian adventure resulted in the destruction of many Cambodian towns and villages, the loss of thousands of Cambodian - almost exclusively civilian - lives. But from a military viewpoint it was a disaster for the United States and its puppets - a disaster the extent of which Nixon has never dared reveal to the American people. The invasion of April-May 1970 was the first baptism of fire for our PNLAFC (People's National Liberation Armed Forces of Cambodia). Within a very short time, Khieu Samphan and his comrades set up three types of forces; local guerrillas and regional guerrillas and a regular army. If, in the beginning, these branches lacked equipment, they more than made up for it by their superb morale. How could it be other-wise when they had seen their homes looted and burned; their parents massacred; their mothers, wives, sisters and daughters raped? If there were Cambodians who still had no clear idea of the difference between a Lon Nol and a Sihanouk after the coup of 18 March 1970, there were none after the aggression committed - by invitation or not - on 30 April. The seeds of our defiance fell on soil fertilized by the blood of our people. Sihanouk propaganda? One need only follow the tragic course of events since 18 March 1970.
is proud to present the story of U.S. Army Special Forces Captain John J. McCarthy Jr, a real American hero. This is true. It happened. And it happened in the United States of America and in Vietnam. Continued suppression of the following facts and circumstances provides history with the opportunity to repeat itself. It already has once. The United States Government claims that publication of this matter will be inimical to the National Security of our country. A more accurate phrase would be National Embarrassment. Stonewalling on this issue has worked for over thirty years. Stonewalling works. It is time to take down the wall. On January 30, 1968, a Top Secret General Court-martial concluded that United States Army Special Forces Captain John McCarthy had murdered a Cambodian "peasant". Although facing the death penalty, the court sentenced McCarthy to "...be confined at hard labor for the term of your natural life." Deliberation on sentencing took all of three minutes. Amazingly enough, the sentence to confinement for life DID NOT include reduction in rank, forfeiture of pay and allowances, nor dismissal from the service. This remains a precedent in the history of Military Justice, i.e., an accusation followed shortly by a conviction. McCarthy was the Case Officer in Saigon, of a CIA directed covert operation code-named PROJECT CHERRY. The operational mission of CHERRY was a redundant, three-pronged assassination team targeted against Prince NORODOM SIHANOUK, the head of state of Cambodia. 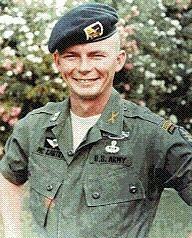 Although McCarthy was technically a member of the United States Military and Special Forces, his role as Case Officer of PROJECT CHERRY necessitated an elaborate Cover Story as a member of the Department of Defense (DOD) and was covered by identification issued by the United States Embassy in Saigon under an assumed name (John McAlister). This "cover" included absolute directives not to openly associate with any members of our military forces in Vietnam. PROJECT CHERRY was not a Special Forces mission. This CIA activity employed Special Forces personnel who were selected for their expertise in relevant skills necessary for the conduct of BLACK TERROR and ASSASSINATION missions. The Project was buried deep within a Military Intelligence unit which was itself operating under the guise of a Civic Action Team, a common CIA cover for covert operations world-wide. Although members of the Civic Action team wore various military uniforms and carried on activities as though they were legitimate military officers, some were full time CIA Agents. The "operational" members of PROJECT CHERRY were Cambodians recruited from the KHMER SEREI, the Government In Exile from Cambodia, violently anti-SIHANOUK and dedicated to the overthrow of the Cambodian Government. The KHMER SEREI was recognized by the Vietnamese Government and operated openly in South Vietnam. PROJECT CHERRY employed twelve members of the KHMER SEREI. Their missions included the conduct of BLACK TERROR against the civilian population of Cambodia, while leaving evidence of their atrocities blaming Cambodian forces for their actions. The purpose of these activities was to create CIVIL UNREST and a rebellion against the Cambodian Regime. It worked. Similar operations utilizing KHMER SEREI were also directed from the United States Embassy in Bangkok, Thailand. PROJECT CHERRY, it turns out, had been compromised by the penetration of an individual who, while holding the rank as the First Secretary of the KHMER SEREI, was the PRINCIPAL AGENT of PROJECT CHERRY and also an Operative Agent of the SOVIET KGB. He was also employed by the SIHANOUK Government at the same time. This information was provided to the United States Embassy in Saigon in February, 1967, by the leader of the KHMER SEREI, SON NGOC THANH. The Americans of PROJECT CHERRY were not notified of this revelation. This triple agent's name was INCHIN LAM. As Principal Agent, LAM coordinated the activities of the Cambodian members of PROJECT CHERRY and also packed the parachutes used by all team members, including the Americans. Lam was also involved in the murder of one of the Cambodian members of PROJECT CHERRY. During the course of events in November, 1967, McCarthy was directed to disband PROJECT CHERRY, supposedly for budgetary considerations, and disburse its members to collateral organizations. All Cambodian members of PROJECT CHERRY were subsequently rehired by Studies and Observations Groups (SOG) targeting Cambodia, with the exception of INCHIN LAM, the Principal Agent, who could not be rehired due to unknown reasons. The only response from those employing other members of PROJECT CHERRY was, "...they would not touch LAM with a ten foot pole". LAM's association with the Soviet KGB and the SIHANOUK Regime was not known to McCarthy at that time. (It was later learned that the CIA was frantically attempting to re-double LAM against the KGB and was releasing him from all covert activities in this attempt). LAM was taken from his "Safe House" in Saigon by McCarthy and one of his sergeants, and driven during the hours of darkness north from the city to an area occupied by a Special Forces Detachment at Ho Ngoc Tao. The purpose for this trip was to question LAM because of other issues which had just come to light during attempts to re-hire him. During the ride LAM was shot and killed from outside the vehicle by persons unknown. By McCarthy's direction, the vehicle was driven to the Special Forces Detachment and directives were given to contact an individual to assist in the temporary disposal of LAM. It was anticipated that LAM's remains would be turned over to the KHMER SEREI, as were other members in case of death. Shortly after returning to Saigon, McCarthy was arrested and accused of the murder of INCHIN LAM. Within three days the United States Embassy in Saigon provided a $25,000 Death Gratuity to the KHMER SEREI in hopes of appeasing them over LAM's death. The KHMER SEREI were somewhat confused. Although they did not express surprise or anger in LAM's death, they could not understand why the United States Government was going to prosecute McCarthy. After all, they had told the Embassy months earlier of LAM's true allegiance. The KHMER SEREI subsequently presented McCarthy with a plate of gold and a commendation, since the US Government had provided McCarthy's real name as the culprit in this matter. The KHMER SEREI kept the $25,000 but they wondered how anyone could be tried for such a "revolutionary" act. The Central Intelligence Agency offered John a ten year sentence if he would plead guilty to murder, avoid a trial, and go along with the CIA's murder of a triple agent to protect the truth that they had turned LAM back on his communist comrades. Because he was innocent of the crime John flatly refused the offer. After 65 days of pre-trial confinement at Long Binh, Vietnam, in a 5 x 7 foot box, topped with chicken wire, a continuously burning light bulb, and a tin roof, McCarthy was tried and convicted of premeditated murder. The TET offensive of January 30, 1968 began twenty-five minutes later. The government's key witness at trial, held virtually in-camera, was a pathologist. Captain Richard T Mason testified as an "expert" witness that LAM was killed by a .22 caliber bullet with the muzzle of the weapon held loosely or tightly, "Ébut in any case against the neck" of the victim, LAM. This testimony compelled the jury to convict, despite contrary evidence. There was also testimony about "stingers" at trial. These were single shot devices made for the CIA as assassination weapons. Although McCarthy had a .38 caliber revolver, and the sergeant with him that night had a 9mm pistol, it was Mason's "expert" testimony that won the day. Both Robert and Ted Kennedy responded to appeals by McCarthy for assistance. They wrote letters and made calls on his behalf which had no effect on CIA's directed outcome of his trial. Bobby was assassinated on June 5, 1968. After five months in the 5 x 7 "box", McCarthy was transported to Fort Leavenworth, Kansas, in a "prison shipment". In September, 1968 Mason recanted his in-court testimony, in writing. He sent the recantation to Lieutenant Colonel PIERRE FINCK, his boss at the Armed Forces Institute of Pathology, in Washington, D.C. FINCK had conducted the autopsy of President John F Kennedy, in November of 1963, and had testified before the WARREN COMMISSION. FINCK was contacted in 1969 by one of McCarthy's lawyers but denied knowledge of any new or relevant information in the case. Mason didn't think it necessary or appropriate to advise McCarthy or his lawyers of his recantation. In 1970, a lawyer working for FINCK approached McCarthy's attorney in the Pentagon Cafeteria and asked if he had seen the "McCarthy File". Expressing surprise, both attorneys proceeded to FINCK's office and located the filing cabinet. The first document in the file was Mason's recantation. The second item was an FBI Lab report signed by J Edgar Hoover. This lab report was in response to a request for analysis of a bullet fragment removed during the autopsy of LAM. The FBI Lab report dated February 9, 1968, ten days after trial, states that the make, caliber and manufacturer of the bullet fragment could not be determined. However, the report continued, a piece of quartz was stuck to the bullet fragment. When LAM was shot, the front windshield of the vehicle had shattered, the there had been a hole in the windshield two inches from the passenger side post. Again, Mason had not thought it necessary or appropriate to notify the defense attorneys or McCarthy. The FBI sent the bullet fragment back to Vietnam "under separate cover" from the lab report. The bullet fragment was lost in the registered mail. McCarthy's defense team never had the opportunity to independently analyze the fragment. McCarthy's lawyers immediately filed a brief with the appellate court, which cited Mason's recantation as "newly found evidence and fraud on the court". The conviction was set aside and a new trial was ordered. One of the three appellate judges disagreed with the recommendation for a new trial. To him, McCarthy's "record in intelligence and intelligence related operations, as well as the military skills associated therewith, which he has developed," made it in defiance of "logic" that he would have murdered "the victim in the manner developed by the Government at trial and urged upon us during appellate argument." Terming McCarthy a "proven officer, thoroughly trained in intelligence operations, well-disciplined and sensitive to the ramifications of all his actions, not only with regard to the United States but to other political entities whose interests might be affected," that judge said the court should have forbidden a retrial. Then Government prosecutors described the possibility of a conviction at a new trial as "highly unlikely" and the charge of Premeditated Murder was dismissed on January 8, 1971. Immediately following the dismissal, the following organizations were briefed because of anticipated fallout: CENTRAL INTELLIGENCE AGENCY, STATE DEPARTMENT, FEDERAL BUREAU OF INVESTIGATION, DEFENSE INTELLIGENCE AGENCY, NATIONAL SECURITY COUNCIL, and THE EXECUTIVE DEPARTMENT, (PRESIDENT NIXON). The US Government was so anxious to obtain a conviction at trial they had resorted to FABRICATING evidence in the guise of Mason's EXPERT testimony. Statements by the ranking member of the court-martial board revealed that had Mason's recantation been known or the FBI Lab report been available, the court would not have reached a guilty verdict. However, this same board member did state that if the Government had thought McCarthy innocent, they certainly would not have tried him for murder, and the court had their duty to convict. Therein lies the rub and the miscue of military justice. The statement of "we don't know how he did it, but we think he did it" exemplifies the issue. In 1984, under the Freedom of Information Act, a search of the files in the STATE DEPARTMENT was requested with negative results. No files existed with respect to the above. However, in the office of the ASSISTANT CHIEF OF STAFF of INTELLIGENCE in the Pentagon, an affidavit dated 1968, written by the Assistant Chief of Staff addressed the concern of the STATE DEPARTMENT over the issue of granting McCarthy's civilian attorney a Top Secret clearance in order to review the files in the above matter. The information in the McCarthy case, if leaked, would seriously effect the Foreign Policy of the United States. And, of course, STATE was briefed on January 8, 1971. Also, during the summer of 1968, STATE had requested copies of the Record of Trial and allied paperwork from McCarthy's defense counsel in the Pentagon. After reviewing the material for a week, the representative from STATE returned the documents with the comment; "Had we known that this information was going to be revealed, we would never had allowed the trial to proceed in the first place". And yet there are no files on this matter at the STATE DEPARTMENT. This is of far greater significance than just denying the existence of files. What it means is that STATE was not aware of PROJECT CHERRY to begin with, and although BLACK TERROR and ASSASSINATION missions were under purview of the CIA, the STATE DEPARTMENT would have known of these activities when sanctioned by the President. Because STATE was not privy to these activities in Cambodia, there stands a very good chance that the operations conducted by PROJECT CHERRY were a ROGUE CIA directed activity designed to prolong and extend the war in South East Asia. On October 2, 1968 John, sitting in his prison cell at Ft. Leavenworth, received a Western Union telegram from Ted Kennedy which read, "Keep chin up. Stand by for good news shortly." On Oct. 6, 1969 he was summarily released from prison and remained in a state of limbo while CIA and the Army decided what to do with him. He was sent to the Army's premier intelligence post, Fort Huachuca, where, as a convicted murderer, he was allowed to instruct other troops, in spite of the fact that he had no security clearance. On February 8, 1970 in an article in the Washington Post entitled "Terminated Agent May Haunt U.S.", Murray Marder would write: "(W)hile comparatively obscure, the McCarthy case carries a larger potential for international complications than the celebrated Green Beret case". Eleven months later the charge was dismissed. The Constitution of The United States guarantees all citizens the right to seek redress for grievances against the Government. The exception to this First Amendment Right is the FERES Doctrine adopted by Congress in 1952, which states that no member of the Armed Forces may seek redress for grievances which is "incidental to service". Therefore, those citizens who wear their country's uniform into battle in order to protect the Constitution, forfeit their Rights under the Constitution. There is no recourse. John McCarthy honorably left the service on August 2, 1971, after eleven years six months and six days of active duty. His written statement on request for release from active duty was simply put: "I no longer have the desire to serve as a commissioned officer in the United States Army". A personal note; the utter devastation of incarceration, loss of wife and children, mother and father, friends and relatives, and employment and other issues is far too voluminous for inclusion in this synopsis. © COPYRIGHT 1998, 1999, 2000, JOHN McCARTHY. ALL RIGHTS RESERVED. PERMISSION TO REPRINT ONLY IF THE FOLLOWING APPEARS: "Permission to reprint courtesy of John McCarthy and Michael C. Ruppert - FROM THE WILDERNESS @ www.copvcia.com." CONTINUITY NOTE: Before a nuclear detonation can occurr, two 'sub/critical' masses must be joined to form a 'super/critical' mass. This ensures a nuclear detonation, or fission. The above synopsis is a 'sub/critical' mass, which, when combined with the following 'sub/critical mass', ensures the 'super/critical' mass of Treason In Wartime. The conclusion is irrefutable. That is to say it cannot be ignored. It has been for the past four years by the chief law enforcement officer of this country. But not for much longer. and the following parts 3 to 6 on the issue of Treason in Wartime.